When it comes to outdoor sports Chamonix, surrounded by sheer faced aiguilles and lofty snow-capped mountains, is a body of work. If however you take your attentions indoors, the list is but a long, well-conditioned, arm. Below we’ve outlined for you, from shoulder to fingertip, the long arm of Chamonix Sports Centres! In this article we define a sports centre as anywhere indoors where you can practice not only a sport but physical activity in general too. Starting at the top, the biggest muscular group, taking the most weight and the responsibility as Chamonix’s premier sports centre on its shoulders is the Richard Bozon Chamonix Sports Centre. This multipurpose sport complex features a swimming pool, climbing wall, squash courts and a gym. Not only that there is an international-sized hockey stadium that caters to hockey teams, exciting invitational matches, as well as public séances and of course, figure skaters. You can even rent the stadium out for corporate functions with mini hockey games to test your employees’ competitive nature on ice! With a fully equipped gym (salle de musculation), and the community that goes with it, Richard Bozon has a strong backbone of loyal #fitspo fans. There is a great selection of body building and cardio equipment as well as fitness classes such as aerobics, dancing, stepping, circuit training, stretching and toning classes. The complex even hosts children’s sessions such as ballet, a bouldering wall and ultimate frisbee. The jewel in the crown though is aqua offerings: sauna, steam room (hammam) and swimming pool. The indoor pool is a modest 25m long but does feature a separate children’s pool with bubble jets and a water slide. A larger, 50m pool, can be found outdoors for use in the summer months. As is often the case in France, men of all ages must wear form-fitting Speedo-style trunks, which can be bought on site if you don’t have your own pair. Our favourite part about the Richard Bozon Sports centre is the giant indoor tennis area. With its large wooden roof it feels as though you’re playing tennis in the hull of a boat. Not only that, but there are also outdoor tennis courts (naturally) as well as beach volleyball, all set against the backdrop of Mont Blanc. If you’re a tennis head, have a look over here to find out where you can put your racquet to use at the sports centre and beyond. Now flexing the bicep/tricep region are the Chamonix sports centres and community halls of Les Pelerins, Les Houches and Servoz. Espace Evasion is the Les Houches bicep at the Salle Olca 74310 les Houches. Espace Evasion offers you a range of sports activities for the whole family! From 3 years it’s Baby Baïla, and from 4 years try Baby Gym. For teens and adults there is badminton, yoga, BodyScult, Tabata, Metafit, pilates, Zumba and street dance courses for all ages hosted every evening, and on Wednesday mornings. Meanwhile the tricep is AGV Chamonix at the Pelerins gym (gymnase des Pélerins) run by Anne Marie. Join in the fun at 79 Chemin des Campènes with gymnastics and pilates on Monday and Thursday nights. Joining in nearby is Servoz with Et si on bougeait (“What if we got moving?”) in the local school hall. Every night and Wednesday mornings there is general fitness, interval training, zumba, pilates, postural ball workouts, stretching and more at 174 Route des épicéas, Le Lac 74310. This is organised by Karine LaForme. Moving down to the elbow, this next sports centre is constantly moving and changing. 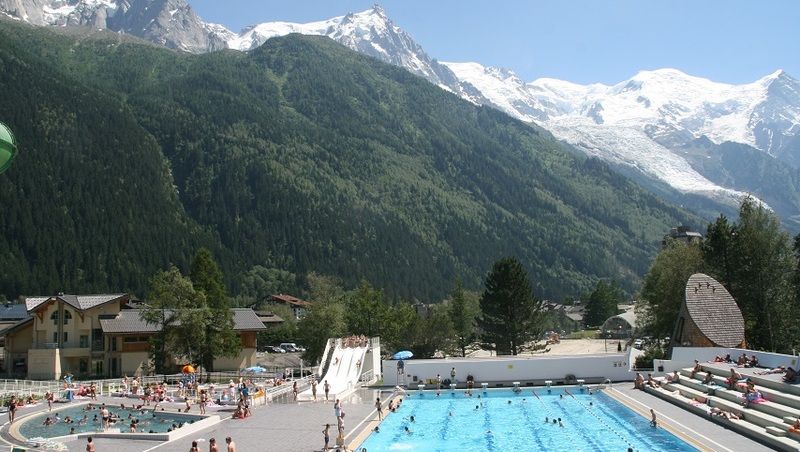 The MJC de Chamonix is actually a community centre that offers a wide ranging list of activities, courses and classes that extend naturally to sports! Found behind the children’s play park just off Place du Mont Blanc, this multiroom complex is where you can discover an eclectic timetable that this year includes: stand-up paddle boarding, pilates, yoga, jazz fusion, contemporary dance and Brazilian capoeira. Don’t be afraid to stop by and see if you are able to join in any activities as a guest and visitor to Chamonix, the staff are lovely. You can even message them on Facebook! Or if you are doing a winter season or live locally be sure to sign up as soon as you see their announcements for the following season usually released in August/September. You can find the current timetable on their website, or in print, distributed widely throughout Chamonix. Next comes the forearm, and where do you need such strength the most? None other than the indoor climbing gym: Mont Blanc Escalade in Les Houches. Located in Les Houches, this climbing gym is suitable for everyone from complete beginners to experienced climbers. It is generally open daily from 2pm to 10pm, they offer lessons and if you don’t have your own you can hire shoes, harness and chalk bags. There are also two more other climbing gyms in Chamonix however access more difficult to the general public at the ENSA (National School of Ski and Mountaineering) and the climbing wall of the EMHM (Military High Mountain School). The climbing wall of the ENSA is private. To climb you have to be a member or doing an internship at the National School of Ski and Mountaineering. On the other hand, ENSA has a partnership with the Chamonix Sports Club (climbing section) and it opens the doors of its climbing wall 3 times a week in winter. Only one obligation: you must be registered at the club. The climbing wall of the EMHM is also private and belongs to the French army. The room is very well equipped and you will find climbing walls up to 6m high, however most people join for the superior bouldering. There is also a small fitness room with some machines. To be able to use the climbing room you must be registered at the Sports Club of the EMHM. Lastly, at a stretch, representing the reaching fingers of the arm is the Chamonix bowling alley. Some people do not believe bowling should be considered a sport but it is both competitive and physical. Additionally it is played indoors, making our very own bowling alley the last of the Chamonix sports centres on the list. With 8 lanes of bowling, plus a games room with snooker, pool and billiards (ok they are less sporty), the bowling alley at Chamonix Sud has a lot to offer. There is even indoor mini-golf, and we all know golf is a sport… making it a mini-sport at your service. As for the rest of the body of Chamonix? We’re outdoors making the most of the amazing scenery!